The 4MR Winter Market Is Coming! 4MRMarket will become the 4MR Winter Market from November 29th until sometime in April! The winter market will be indoors at the Four Mile Run Park Conservatory Center and many of your favorite vendors will be staying on all winter--including greenhouse produce! A floundering economy and budget shortfalls have been no match for the ingenuity of a small group of residents and area business owners. The Four Mile Run Farmers and Artisans Market celebrated its Grand Opening on Sunday, June 20th, 2010. The market set up on the site of the stalled Four Mile Run (4MR) park expansion with the surrounding community rallying together to address what was once viewed as the City’s most challenging area. "This is the first farmers market opening based on the principals of the recently adopted Healthy Food Alexandria Initiative," said then-Councilman Rob Krupicka at the time. “This is a wonderful initiative by the neighborhoods surrounding Four Mile Run,” added Krupicka. “With little more than sweat equity and a common goal, these folks are taking this gateway into Alexandria to a new level." The market is located at the entrance to Four Mile Run Park, part of a long overlooked and underutilized gateway from Arlington, where, every day, walkers stroll up the park and bikers whiz down the Four Mile Run Trail that connects to Crystal City, DC, Shirlington and the Mount Vernon Trail. With an eye toward formalizing this group into a permanent non-profit "Friends of Four Mile Run Park" (formal name to be determined), the Four Mile Run Farmers & Artisan Market has committed $1000 yearly raised from market operations for various park improvements. Most years, the 4MRMarket team presents the City of Alexandria with a check to further the revitalization of Four Mile Run Park. In addition to making financial donations, the 4MRMarket team has provided site improvements through "sweat equity" and by soliciting donations, both big and small. An anonymous donation of $10,000 helped support a NEA grant to build a performance stage. Other private donations and grants are being sought to provide park furniture, a green roof, plant rain gardens and other park improvements. The efforts have received coverage on NPR. following a successful online crowd-funding campaign. 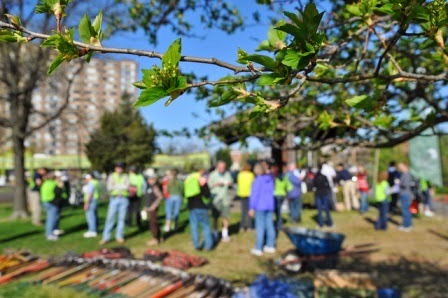 The 4MRMarket team has also been leading and participating in Four Mile Run stream clean-ups over the off-season and assisted Casey Trees and the Arlington Tree Stewards with a massive tree planting adjacent to the Four Mile Park Expansion where 4MRMarket is held. In 2014, in conjunction with the citizen-run Four Mile Run Farmers & Artisans Market, the City of Alexandria launched its first-ever crowdfunding campaign to raise funds to kick-start the recently adopted Four Mile Run Park Improvement Plan by planting new trees in the park. Citizens responded with contributions large and small by donating tax-deductibly via the crowd-funding website. 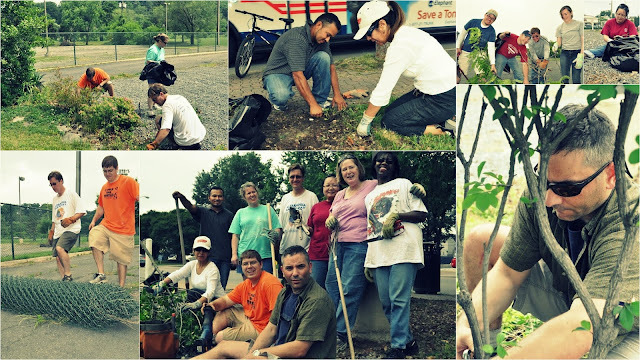 With the arrival of the fall tree planting season, over a dozen new trees were planted in the portion of Four Mile Run Park along the Mark Drive alleyway. 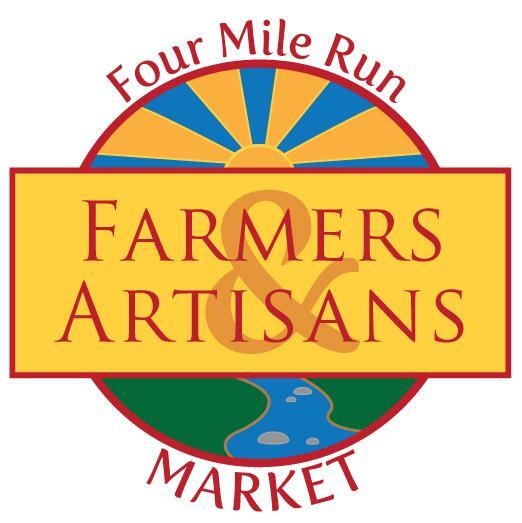 "The Four Mile Run Farmers & Artisans Market brings fresh, nutritious food to people of all income levels, provide an opportunity for local artisans and producers of goods to bring their wares to market, strive to reflect the diversity of the community, and improve the quality of life for Arlandria residents and visitors. 4MRMarket is part of an overall vision to expand and improve Four Mile Run park and the surrounding neighborhood." As a 100% neighborhood volunteer run market, 4MRMarket is proud that the market serves as an incubator for small start-up businesses, a space for non-profits to promote their causes, and a community gathering place for live music, fellowship, and quality food and craft options. Keep on the look-out for more details to come as 4MRMarket ventures into this new undertaking. 4MR Winter Market is open every Sunday from 9am until 1pm from until April in Four Mile Run Park at 4109 Mt Vernon Avenue, Alexandria. A group of neighbors are joining together to help the family who lost their son in a tragedy last week. was a carpenter, DJ and beloved eldest brother with four siblings. 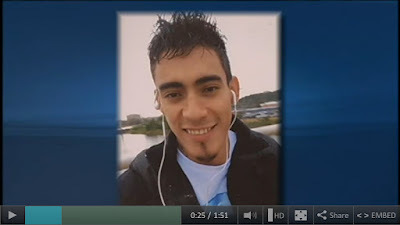 News4's Julie Carey spoke with the mother of Luis Perez, in Alexandria. Jose Luis Ferman Perez was a 24-year-old city resident whose life was taken at the iconic neighborhood playground last week in Beverly Park, aka "the Pit." Many have expressed their desire to help his family, especially his mother who wishes to return his remains to his beloved home country. Any contribution of any size would be help. Your consideration would be appreciated. Financial contributions can be made via GoFundMe. In-kind donations are being accepted through SignupGenius. "On Monday, November 9, 2015, we lost a great person, Jose' Luis Perez Ferman. He was a good son, brother, father and friend. Only 24 years old, he left us to be by God’s side. He was a good person in every possible way. Our family is obviously not prepared for this tragedy and losing a person this loved is painful and unexpected. Funeral expenses are very expensive and we have created this page to request assistance for these expenses. Whatever amount you can provide would be very much appreciated. Thank you and God bless you. We need your support to cover the funeral expenses of Jose' Luis Perez Ferman." The funeral is set for 7pm Saturday at Commonwealth Baptist Church, 700 Commonwealth Avenue in Del Ray. 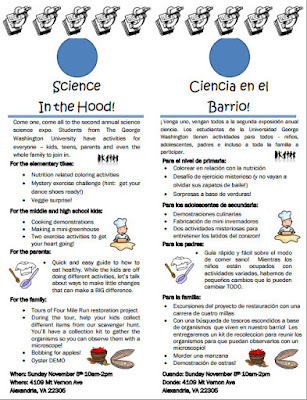 Come one, come all to the second annual science science expo. Students from The George Washington University have activities for everyone – kids, teens, parents and even the whole family to join in. Two exercise activities to get your heart going! Quick and easy guide to how to eat healthy. 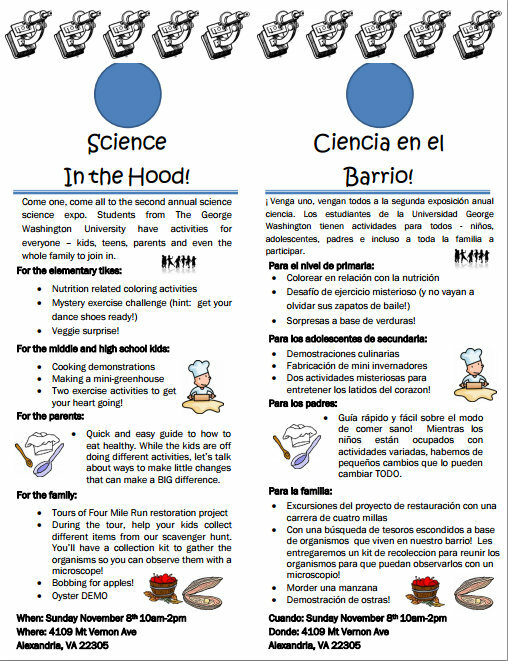 While the kids are off doing different activities, let’s talk about ways to make little changes that can make a BIG difference. During the tour, help your kids collect different items from our scavenger hunt. You’ll have a collection kit to gather the organisms so you can observe them with a microscope! Join the City of Alexandria and TC Williams High School Students at the Four Mile Run Farmers & Artisans Market on Sunday, November 8th to get involved with our local watershed. Tours will be offered of the ongoing Four Mile Run Wetland Restoration Project, and a clean-up event involving trash and invasive plant removal will take place throughout the day. 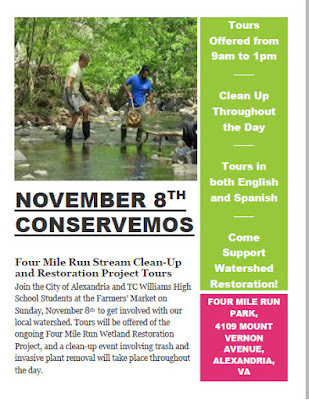 Come Support Watershed Restoration! Efforts!